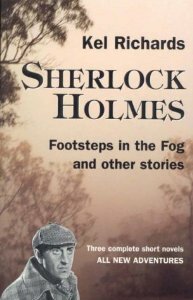 Then you'll love this Sherlock Holmes story that ties in to the serial "Terror of the Zygons," as well as featuring ancestors of some of the Doctor's allies in UNIT! All the details can be found in Crossovers Expanded Vols. 1 and 2. AUTHORIZED companions to Win Scott Eckert's Crossovers: A Secret Chronology of the World Vols. 1 and 2, both books, my first published works, will be available from Meteor House next month! I assume, then, that the CU version of "Terror of the Zygons" involved Doctor Omega rather than the standard Doctor, right? Possibly, though Andy Lane's ALL-CONSUMING FIRE and other CU works establish that the Doctor of the CU (aka Doctor Omega) does have pretty much the same incarnations as his Whoniverse counterpart. Arnould Galopin's Doctor Omega most closely resembles the First Doctor.